Being that today we have been celebrating the birth of Walter Elias Disney, I wanted to write something more personal and meaningful. It’s no secret that Walt Disney is a hero of mine, as I’m sure he is for many who read this. I started to think, why exactly is he my hero? What thing did Walt do specifically that made me think of him in this regard? I mean, Walt accomplished so much in his short life, there’s a lot to choose from. Let’s look at the beginning. Walt was born on December 5, 1901 in Chicago, he wasn’t born wealthy or the heir to some huge fortune. Walt’s father wasn’t the president of some large company that was changing the way the world functioned. Walt never even graduated from high school, and obviously never went on to college. He was an ambulance driver in France during World War I, very heroic to say the least as he was only 16 when he joined the Red Cross. After the War, Walt began working at the Kansas City Film Ad Company. This is where Walt became interested in animation. He decided to open his own animation business, but it eventually failed. He ended up working again for someone else, but never stopped believing in himself. 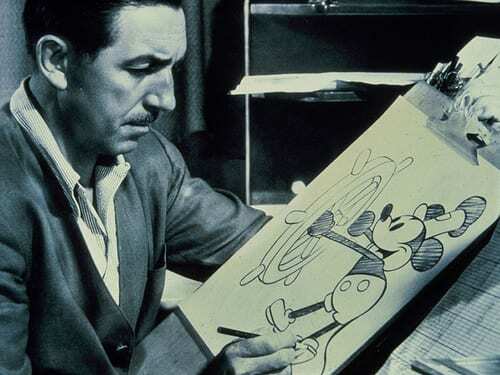 Walt continued to learn and stick to his dreams with animation. He and Roy, his brother, opened their own studio and hired on animators. At that studio they created Oswald the Lucky Rabbit, but because of rights issues, he didn’t own Oswald and lost him and many of his animators. Even though he was getting stopped by others, he kept pushing forward, created Mickey Mouse and the rest is history. I know this is just a brief recap of a few events, but I wanted to give just a little background. The reason I consider Walt a hero of mine is because he never gave up. He failed but when he did, he learned and didn’t make those mistakes again. He was an innovator, he had ideas that people hadn’t even dreamed of doing and he made it happen. He was a true family man. Most men who are very successful in business, sadly are away from their family often. Walt was different, he drove his girls to school everyday, took vacations with his wife and girls, etc. Every Sunday, Walt took his daughters to the carousel at Griffith Park in Los Angeles, to spend time with them. It was these Sundays with his girls that were the inspiration for him to build Disneyland. Did he need to build Disneyland? His studio was very successful at this point, so it wasn’t like he was just starting out looking for a niche. Why did Walt push forward with his theme park idea? Well, at the time, most parks were for kids to have fun and for the adults to sit and watch. Walt wanted a place for families to be able to come together and all enjoy the outing. I’m not saying watching your children play isn’t enjoyable, but Walt wanted a place that every member of the family could have fun together. Disneyland was born. In addition to the park, Walt changed the way films and cartoons were done. He added sound, and made full length movies that were cartoons and they were very successful. He merged the real world with the animated world and amazed audiences. The things that Walt did back then, without the use of a computer to create a fantasy world are still amazing. In addition to the general population, Walt inspired film makers to push the envelope to see what they could do. He wanted people to realize that their imaginations and dreams could be achieved as long as they never gave up. Walt created so much more and I could spend hours talking about all of his inventions. However, I wanted to share why I look at him personally as a hero. If anything Walt taught the world, it’s don’t give up when the chips are down. In life we will all have down times, we will all have times when things don’t seem to go the way we want them to. But hold on to your dream and push forward. When someone tells you “You can’t do it”, look at them and say “I will do it”. If Walt had listened to all the people that told him not to do things, we wouldn’t have his legacy. Sadly, I wasn’t alive at the time Walt Disney walked the Earth, but his legacy of the things he taught and created will always live on. Even since his passing, people learn every day from this man. He touched everyone’s life that he came in contact with. In all of the world, is there a man more well known than Walt Disney? I don’t think so.